KHHI is extremely pleased to have won the supply/make tender of BGN (British Gurkhas Nepal) for this year too - for the recruit intake 2013. We will carry on this honor and duty with utmost pride, care, confidence and enthusiasm. In the long tradition of BGN (British Gurkhas Nepal) where an annual tender is done every year, lately in OCT-NOV, to appoint an official maker/supplier for its new recruits for that particular year, KHHI has successfully won the annual contract for various years and once again we are extremely pleased and honored to announce that we have been once again selected for the year 2013. KHHI’s high quality kukris and its professionalism into the business beat all in the race and BGN officials were very happy to select KHHI yet again. 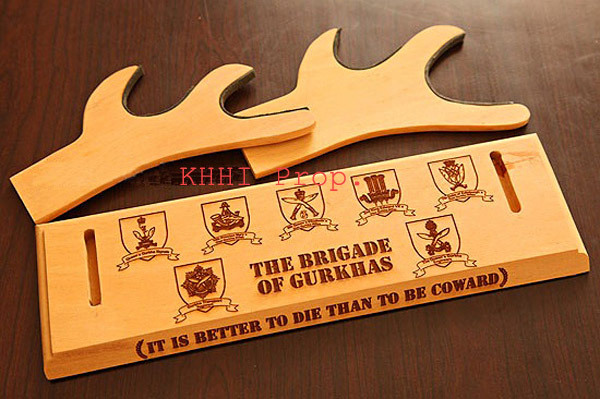 Now KHHI will be supplying/making a total number of 300 pieces of khukuri knives and 200 pcs of Gurkha Hat Badge for the “Recruit Intake 2013” in which each recruit will be issued with 2 khukuris and a Badge. There is a total strength of 126 enlistments for this year. This continual winning of Annul Contract of BGN for the new Gurkha Recruits itself speaks for the level of superior quality and services KHHI delivers. Our sincere gratitude to all our customers and well wishers and the BGN staffs for their trust, support and business. A few extra khukuris and badges have been ordered by BGN as stock or replacement. We have also decided to open the kukris for the general public acquirement. A few extra of the same standard issue kukris that are made for the contract are now available for purchase. 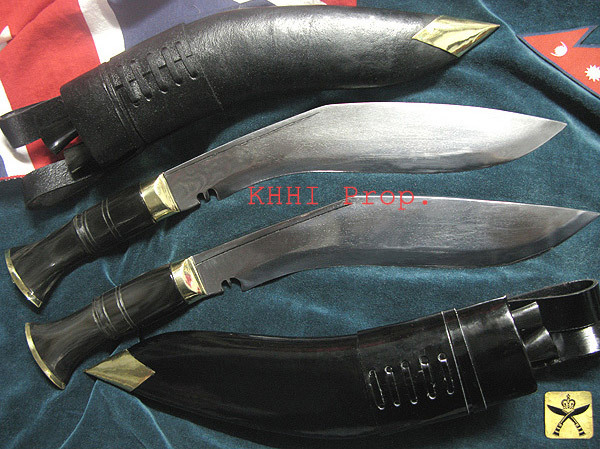 Both blades are exactly same and identical to the 2012 Standard Issue and quite similar to its original version issued in late 1980’s called the “Service No.1 (Sarkhari Kukri)”. 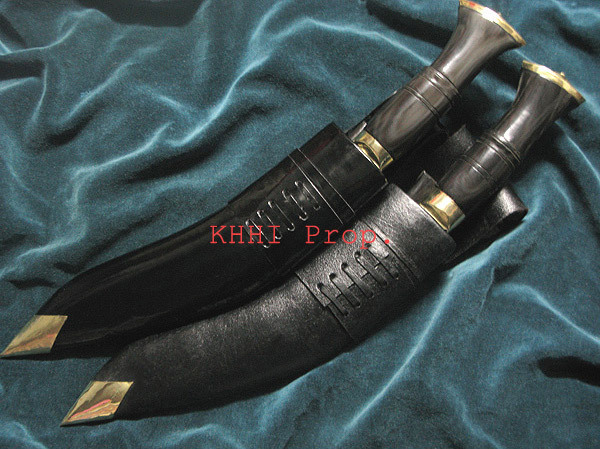 Like the original, it has a regular military (service) shape (that can be seen in the photo) and has water buffalo horn handle attached with brass fixtures. The blade and handle are both done finely and well polished to give an attractive look. Both knives come with two small accompanying knives called Karda (small utility knife) and Chakmak (sharpener). Both also come with military style frog with two belt loops at the back and lace-up style at the front. The only thing differentiating Service No.1 or the Parade knife (BGP) and Service No.2 or the Exercise knife (BGE) is the scabbard it comes with. BGP has shiny patent leather sheath (see photo) and hence carried for parade, on duty and on ceremonial occasions where as BGE has Normal black leather sheath (water buffalo hide) and hence used as a tactical knife and carried for training, exercise and even for combat. 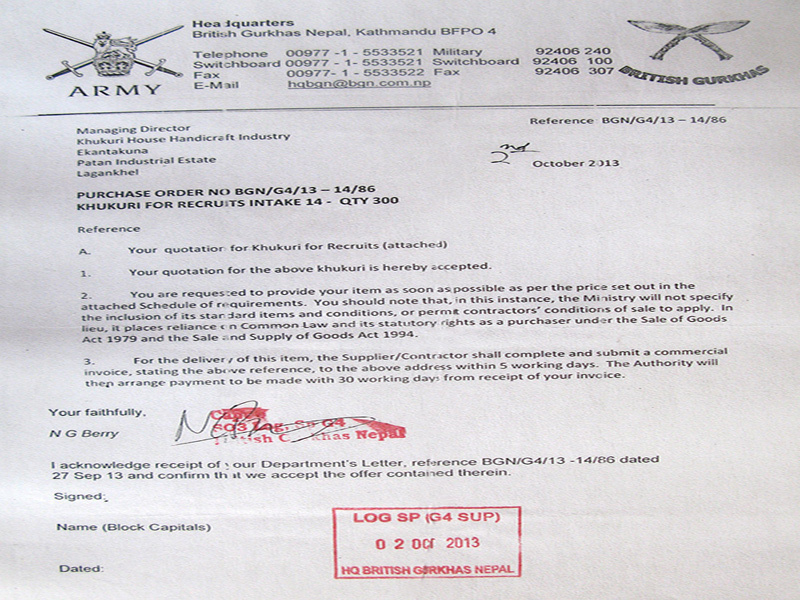 Along with the annual tender of khukuris for this year, KHHI has also won for the Official Cap Badge. 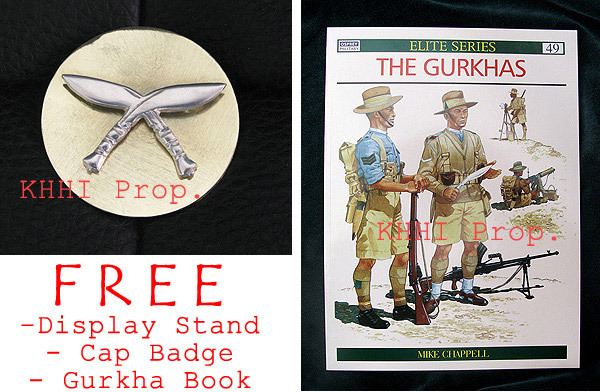 KHHI will be supplying/making 200 pcs of Gurkha Hat/Cap Badge for the Recruit intake 2013. The cap bade will be proudly worn on each hat of the new Gurkha. Just like the Khukuri, a Gurkha Hat with the iconic Cross Khukuri badge has been the renowned symbol, pride and honor for all the legendary Gurkhas. This extraordinary book written By Mike Chappell is one of the best books written on the “Gurkhas” dating back since the 18th century to the modern days. The book covers all the regimental histories, originations, stories and ranks with beautiful pictures. History of both the military exploits and everyday life of the Gurkhas, from their early service in the British Army to the Indian Mutiny through both world wars, as well as their later services after Indian Independence/Partition are all beautifully covered with B&W photos, drawings and sketches. It’s a must see for all Gurkha fans and fanatics.